Anyways, the first pic is seven layers ending with OPI. The second is eight layers deep alternating JS 24 and OPI Pirouette My Whistle. Summer Gradient Nail and Splatter Nails Tutorials! Hey sorry I’m a little behind on the post for these videos but here it is! 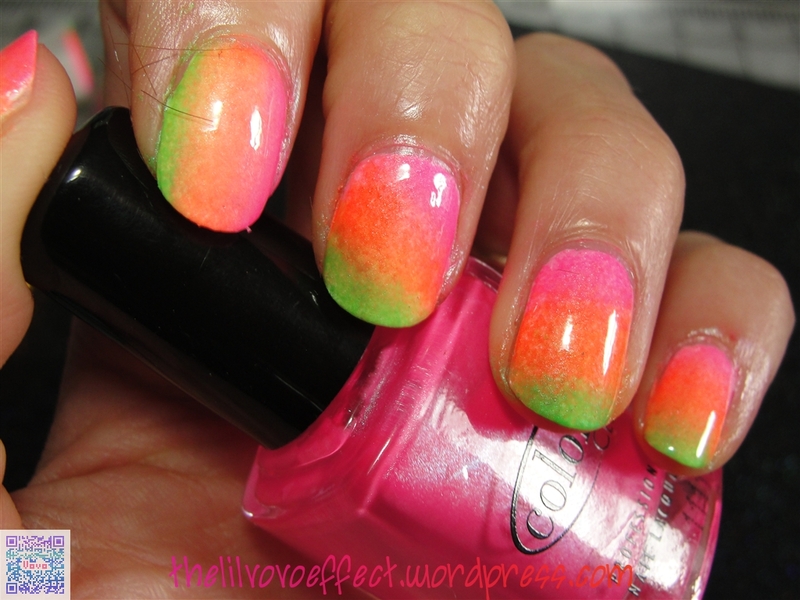 Big thank you to Sammy from “The Nailasaurus” for showing us that you can create a beautiful gradient like a pro! I really felt compelled to mention Sammy because it seemed like after she posted her tutorial that there were tons on people on YT putting up videos (doing the same exact thing she was) and I wasn’t really looking it see if they credited her but I wanted to be sure I did, because I sure as heck didn’t come up with this on my own!! So yea please click the link! And another big thank you to Totallycoolnails on youtube for showing me there are other way to do a splatter nail without a straw! Watching her tutorial totally made me think AH TOOTHBRUSH DUH! Click that link too!!! These girls are geniuses. Even though this summer is big for neons and all the major brands seem to have a summer neon line up, I found this collection at Ross early this spring. It really makes me hesitant to buy any of the new neons out there- as unbelievable as that sounds. Maybe they’re not as neon as some are now? Color Club Electro Candy was from summer 2009. Formula wise I find these are great and pop if you have white polish for a base. All of these (except for Pure Energy<the blue one>) are one thickish coat on top of two coats of OPI Alpine Snow. I also used the “Vivid Top Coat” that came with the set. Which I believe to is to bring out the subtle shimmer in all of these. I must say subtle is definitely the word. A little more visible in person, regardless I ♥ these. If you don’t use top coat these dry to a dull finish. I can’t even say it satin matte because it isn’t! The shimmer in What A Shock should be blue. And this color probably turned out more accurate then the rest. The shimmer in Volt Of Light should be green. And the color should be a little brighter. The collections namesake Electro Candy. Probably has the most visible shimmer which seems to be white. This is very bright but it should be a little more saturated in this photo. Think more like the “dark parts” and less like where the light hits it. Tangerine Scream was insanely hard to capture and it make me wonder how well it would have turned out if I had a light box. This is not accurate at all and think more of a caution cone color with a silvery white shimmer. But I thought I would share the pictures because they look super cool to me. Ultra Violet wasn’t nearly as bad as Tangerine Scream to capture but none the less the color is off. My camera has something against purples. What’s in the bottle in this pic should be a touch darker and it has a beautiful blue shimmer that is so pretty IRL. Pure Energy is another one that should be a bit darker with a light blue shimmer in it. Super subtle in this one. Oh and this one is two coats over two coats of white. So here is a really pretty light chrome blue! OH GOSH! *drool* I love love it. It’s a one coater so this will be good for stamping! Dry time was fast and this is without top coat! a total win. I’ve increasingly have less to say about polish lately. My admiration is the same just not feeling as chatty lately. Hi hi hi! 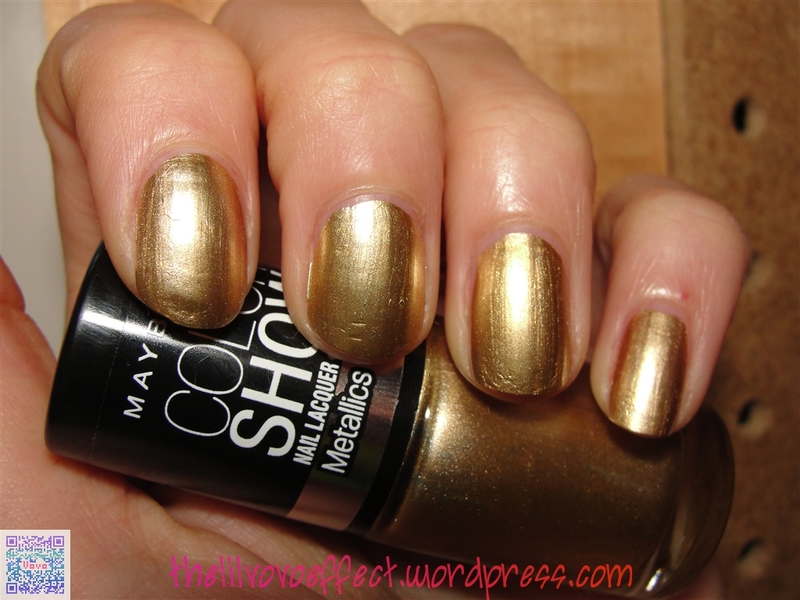 So I did go back and get ONE more Maybelline Color Show nail lacquer. I did get another metallic- yes I know I complain about the fact that you can see imperfections more with these- BUT color and application wise these do not disappoint. Bold Gold is ONE coats, I do not lie! It dries fast! I did not put a topcoat on this since I do like the satin matte finish. This is one coat need I say more? IT’S PERFECT. The only thing I do not like about these metallics are that if you have peeling nails on the tips like I do- you will be able to see that very plain as day! Same goes for Amethyst Ablaze. For me that’s not enough to scare me off- I think they’re probably my favorite metallic polishes. Sinful Colors Pandora in 2 coats! I thought this might be a bit more sheer then it actually was. Built up really nice, very smooth and has a beautiful subtle pink/gold (bronze?) shimmer to it. This I think was from their Cast Away collection. I don’t think I would have been able to get this when I did because the display has been long gone but our Walgreen’s is so dead 80% of the time that this bottle was still floating around the beauty department. Lucky me! But that being said- sometimes I underestimate and things I think will still be there later- wont be (hence the frenzy of me buying 3 bottles of Green Ocean).